Rick Rack's Thread Therapy for Sewers features ribbon crimp ends and heart-shaped split rings in a step-by-step ribbon key fob how-to video. 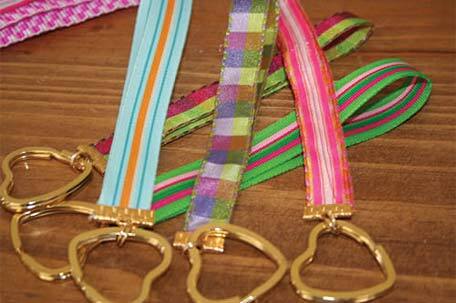 See how featured host Pattye Duffner incorporates these to create a stylish and functional key fob. View the online how-to video here for design inspiration. Rick Rack is VirtueRadioNetwork.com's online sewing show. © 2009 Virtue Radio Network. Video is provided with permission from VirtueRadioNetwork.com.